Most of all: it’s surprisingly compact, occupying only 2 723 sq. km. People usually talk of Paris intra muros. That means the City inside the walls, which today is nothing other than the périphérique, the highway that runs around it. It only has about 2 200 000 inhabitants within those confines, but the whole metropolitan area has an estimated population of nearly 12 million. Just behind the périphérique the so-called banlieue, or suburbs, begin. They can wealthy, even very wealthy in the West and South (Neuilly for example); these areas used to be much more popular that the East (but with climbing real estate prices this is slowly changing); it is still poor in the North, with a huge immigrant population. So imagine a compact City divided into two parts by the River Seine. There is Rive Gauche, Left Bank, and Rive Droite, Right Bank. To understand the designations, imagine standing on a bridge over the Seine and facing downstream: to your right is the north bank, to your left the south bank. Are you rive gauche or rive droite? But it’s not only a geographic division. The Seine splits the city literally into two different towns. Right Bank historically used to be the part where business, money and entertainment dominated, whereas Left Bank was the more cultural, intellectual part of Paris with its universities, publishing houses and galleries. Even if this is not the case anymore, true Parisians know whether they belong to the one side or the other. Many of them wouldn’t move to the other side of the Seinefor anything in the world. Others dare to do it but consider themselves converts afterwards. And I've even met people who wouldn’t cross the Seine for a dinner invitation. You are a tourist, lucky you, feel free to love both parts of Paris. You do not need to make a life-choice, just choose a hotel in one or the other part where it suits you best. But there a few things you should know for to orientate yourself, and when you need to have some an idea where a shop or restaurant is situated. 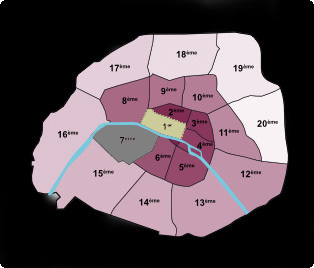 Paris is divided into 20 arrondissements, municipal zones that spiral out clockwise from the 1st (Rive Droite) to the 20th arrondissement. That’s why, on a map, it looks like a snail. The very core of the City is formed by the first 8 arrondissements. The second ring starts with the 9th and goes on to the 20th. Have a look on the map here and try to memorize which arrondissements are on the left, and which areon the right bank. The two last digits of a zip code (that in Paris always starts with 75) indicate the arrondissement. If you see an address with a 75003 zip code, you know immediately that you are looking for the 3rd arrondissement. If you’ve memorized that the 1st arrondissement starts Right Bank with the area around the Louvre, then you already have an idea of where you have to go: the place you’re looking for is fairly central on the rive droite. Street numbers also provide you with a lot of information. In streets running parallel to the Seine, numbers go up with the run of the river, running from east to west. The Hotel Le Meurice for example is on 228, Rue de Rivoli. You know now that it must be situated on the western end of the Rue de Rivoli, close to Place de la Concorde. The same is valid for streets running perpendicular to the Seine: the counting starts at the Seine. A street number such as 110, rue de Turenne tells you that the place you are looking for is at the northern end of the street because rue de Turenne is a right bank street. 110, rue de Saint-Jacques would be the opposite : the house you're are looking for is away from the Seine, at the very southern end of the street, because rue Saint-Jacques is situated Left Bank. Bingo! You’ve got it. You’re a Parisian now. Imagine Paris like a snail!